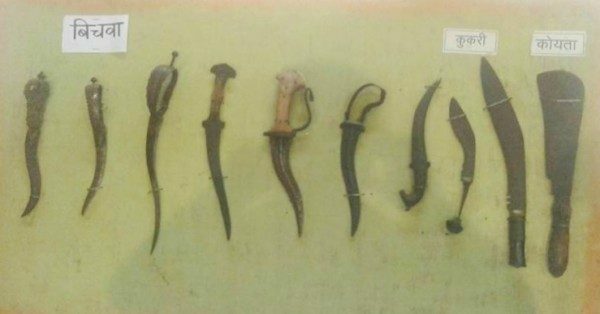 In a rare occasion the citizens Belagavi can in actual see and feel the weapons used by Chhatrapati Shivaji Maharaj and other weapons used during that time. This has been possible, Thanks to the Khanapur taluka Belagavi Residentials’ Organization who have organized the exhibition at Maratha Sanskritik Bhavan on Mahatma Phule Road, Shahapur from 10am to 8pm on September 10 & 11. Apart from war weapons there will be around 200 paintings and pictures of different forts in Maharashtra and depicting Maratha culture. The main objective behind this exhibition is introducing the glorious past history to the present generation. Around 500 war weapons including different types of swords, knives, shields, battle attires etc. are on exhibit. Thanks to Durgveer for taking efforts to collect these historical war weapons!